It's funny that last week I started the newsletter out with 'it would be nice to have a crystal ball'. Our Thursday CSA folks already got a little note in their box that a few things in their box had pock-marks on them from hail. We had to make a substitution in the shares for the lettuce mix; which looked like someone had tap danced on it. It's true, we got 7 minutes of marble sized hail last Tuesday night and it did damage to our mid-sized tender leaved crops: two weeks worth of lettuce mix, the chard, and Toscano and Russian kale. It's nothing we won't recover from. And for a variety of reasons, it was a really good learning opportunity. Last Monday I was riding a wonderful euphoric farming high as we came around the bend of the half way point of the harvest season. We had withstood multiple spring wind storms, unseasonably warm early weather, an unseasonable cool July, more than average rain, and everything was looking SO GOOD! We started getting the garlic in and out of 1200 heads there was maybe a pound of garlic that wasn't premium, and I'm estimating the average head size at 6 oz. (AMAZING!) It seems the fertility management and crop rotations we've been practicing the past four years are working! 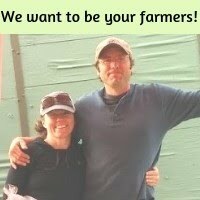 And we are selling out at market, could be taking way more, and our CSA has a waiting list! (YEAR FOUR! WAHOO!) We saw a bit of a gnarly storm coming on the Doppler and rushed to get things covered. As soon as the hail started I set the timer and prayed for it to blow over quickly. I learned a lot from the storm about being ready next time, and I was also reminded that things are going to happen and we won't be ready for them, and that is part of the deal. It leaves us with just that much more wonder and respect that in 8 weeks a seed not much larger than a grain of sand can grow into an 8 pound cabbage. And in the blink of an eye, it can be returned to the earth. And more seeds can be planted to takes its place. We're finally getting some seasonal weather stuff on the farm this week, and plants are just going crazy! 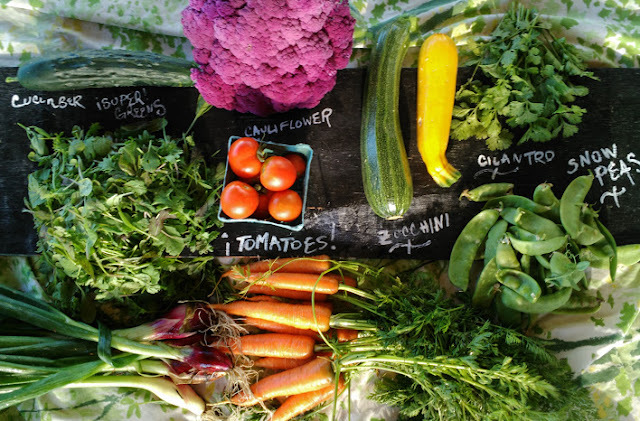 Get ready for summer-time veggies in your box. Tomatoes (DO NOT REFRIDGERATE YOUR TOMATOES) will be in a separate bag at pickup. There will be a Partial and Full sized paper bag of tomatoes this week! 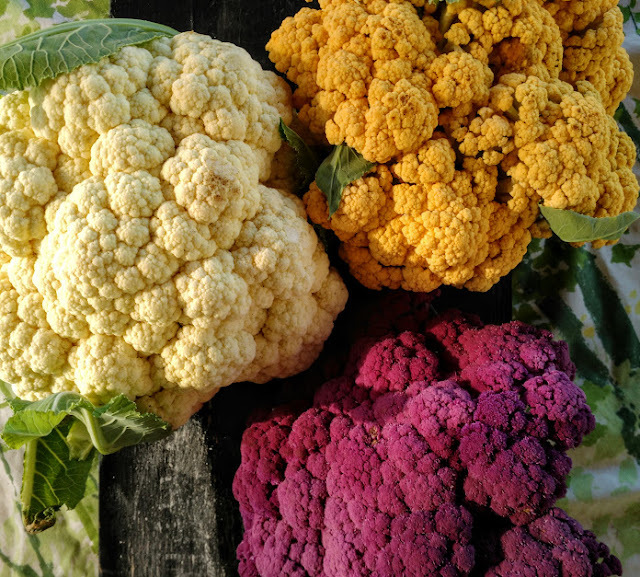 Let's talk about this cauliflower. We are trialing a bunch of varieties this year and we have purple, orange, and white. They all taste pretty much the same despite the awesome differences in color. I love roasting cauliflower in butter in the oven, but now that it's hot out we will most likely be brushing it with avocado oil (my favorite for high heat grilling) and grilling it in our grill basket. Lolla de Rosa or “red long” is an heirloom sweet red onion. They are great raw or cooked in any dish. Cucumbers some of the cucumbers we are growing will look very familiar to you and some are going to look super unfamiliar. They are all wonderful and you just peel them, slice them, eat them. We will be putting a visual guide to our cucumbers on our facebook/instagram page later this week to help you identify what kind you are getting in your box. Tomatoes the small very regularly shaped tomatoes are a mini slicer 'saladette' variety called Glacier. After trialling DOZENS of tomato varieties the last three years I'm really happy with the big tomato flavor in those little tomatoes. Glacier will be happy to sit on your counter until you get around to eating them. The irregularly shaped thinner skinned tomates are heirlooms. These are packed with flavor but don't have much shelf life; if fully red they should be eaten in 1-2 days. If still a bit orange in the 'shoulder,' it can sit on the counter a few days. 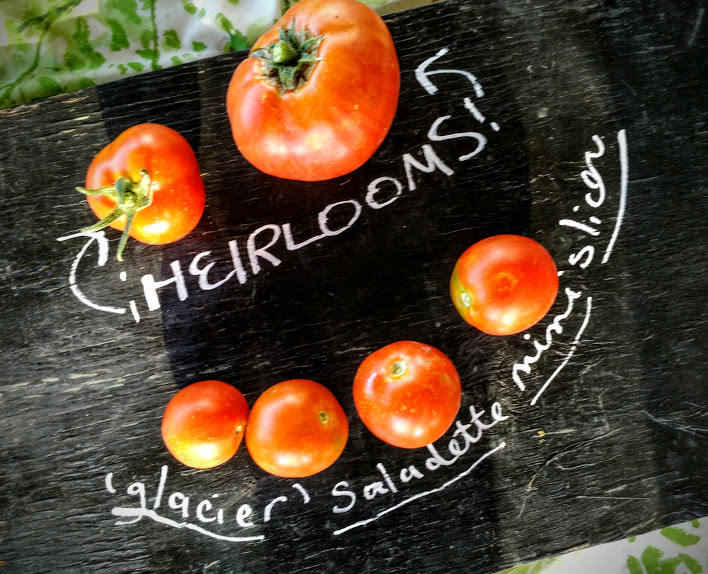 ALL OF OUR TOMATOES (as well as EVERYTHING ON OUR FARM) are non-GMO!